Power-supply solutions for active-matrix TFT-LCDs. 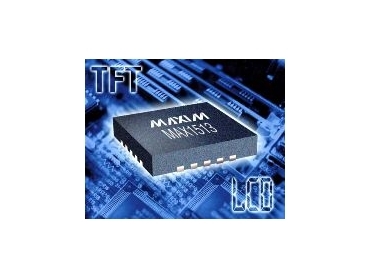 MAXIM Integrated Products has released the MAX1513 and MAX1514, complete power-supply solutions for active-matrix thin-film transistor (TFT) liquid-crystal displays (LCDs). Available from Arrow , each devices includes a high-performance step-up regulator controller, three linear-regulator controllers and an adjustable-delay block for start-up sequencing. The MAX1513 includes an additional linear-regulator controller and a buffer amplifier. These controllers operate from a 2.7V to 5.5V input supply and provide overload protection with timer-delay latch on all the regulated outputs. The step-up regulator controller drives an external N-channel MOSFET to generate the regulated supply voltage for the panel source-driver ICs. Its current-mode control architecture provides fast transient response to pulsed loads. The switching frequency of up to 1.5MHz allows use of very small inductors and ceramic capacitors while achieving efficiencies over 85% using lossless current sensing. The internal soft-start effectively limits the input-surge current during start-up. The MAX1513 and MAX1514 gate-on and gate-off linear-regulator controllers provide regulated TFT gate-on and gate-off supplies. The gate-on supply is activated after an adjustable delay following the step-up regulator. The logic linear-regulator controller creates a low-voltage logic supply. The gamma linear-regulator controller can generate a gamma-correction reference supply or a general-purpose supply rail. The MAX1513's high-performance buffer amplifier can drive the VCOM or the gamma-correction divider string. This amplifier features high short-circuit current (±150mA), high slew rate (10V/microseconds), wide bandwidth (12MHz), and Rail-to-Rail inputs and outputs. The MAX1513 and MAX1514 are available in a 4mm x 4mm, 20-pin TQFN package with a maximum thickness of 0.8mm suitable for ultra-thin LCD-panel design.